Our local gym juice bar allows you to replenish and hydrate your body after your intense workout at Ellis Athletic Center in Newtown Square. It’s important that you fuel your body with the nutrients that it needs so you get the most out of every rep, lap, squat, and lift in our gym. Our juice bar is stocked with healthy, fresh, and delicious products that can be tailored to your specific nutritional needs. 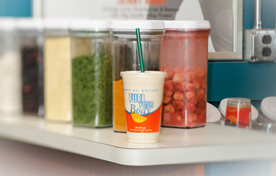 You’ll find the nutrition you need at our full-service juice bar that serves super-healthy PFC smoothies. These incredible tasty smoothies have no preservatives, additives or trans fats, so you can feel good about fueling your body. Ellis Athletic Center is setting itself apart from other local gyms in the Newtown Square area, and our juice bar is just one of the ways that we’re doing this. Along with the delicious juice bar where you can fuel your next workout, you can take advantage of our towel service, day care services, or jump into one of our incredible group fitness classes. We have everything you need so you can start meeting your fitness goals. Stop by before or after your next workout and try our juice bar for yourself! If you aren’t already a member of our gym, you can learn more about membership by giving us a call or contacting us through our website for more information.